Michael Sutton was appointed Concertmaster of the Bloomington Symphony Orchestra in May 2014. 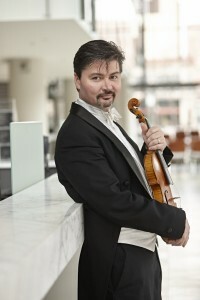 Sutton has been a proud member of the Minnesota Orchestra since 1997. Sutton grew up in Minneapolis, studying at MacPhail Center for Music. He left for Manhattan School of Music where he earned two degrees. Next, Michael went to Miami Beach to join the New World Symphony. After living abroad for two summers each in Japan and Europe playing in music festivals–and getting New York and paradise out of his system, it was great to come full circle…back to the Twin Cities. Sutton is a regular coach for the Greater Twin Cities Youth Symphonies, and teaches part-time at MacPhail Center for Music. Michael is married to the ever-vivacious Beatrice Blanc, a Suzuki teacher, also at MacPhail.